I have a billion blogs in my mind about the Chargers crushing the Bengals to advance in the playoffs. I was a tweeting machine during the game. So fired up. Giddy beyond comprehension. So much to say about it… yet, so little time. I’ll be putting up blogs about the game throughout the week. 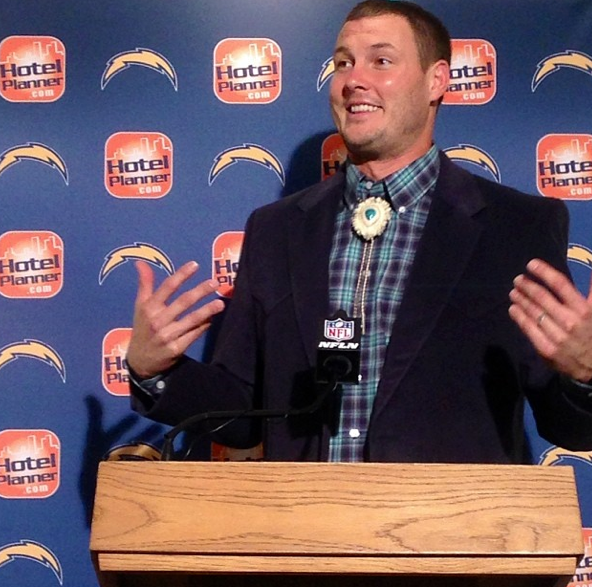 Philip Rivers has taken the legend of the bolo tie to historic levels. What was a fashion statement that only LobShots and few local folks were talking about a few weeks ago has now become a national phenomenon. Do work, Philip! Time to ride* the bolo wave to the Super Bowl, kids. This entry was posted in Football and tagged bolo know, bolo knows, bolo tie, Chargers, Philip Rivers, rivers bolo, rivers rivers, team bolo. Bookmark the permalink.